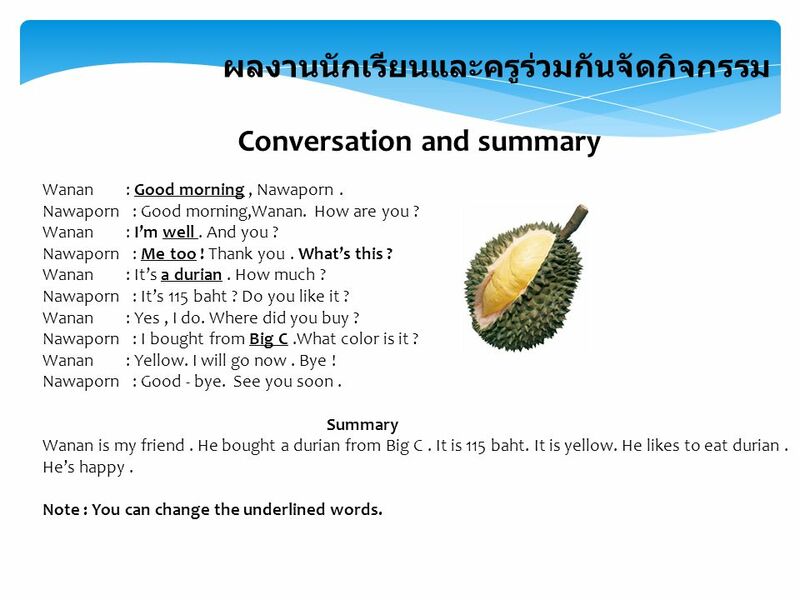 Conversation and summary Wanan : Good morning , Nawaporn . Nawaporn : Good morning,Wanan. How are you ? Wanan : I’m well . And you ? Nawaporn : Me too ! Thank you . What’s this ? Wanan : It’s a durian . How much ? 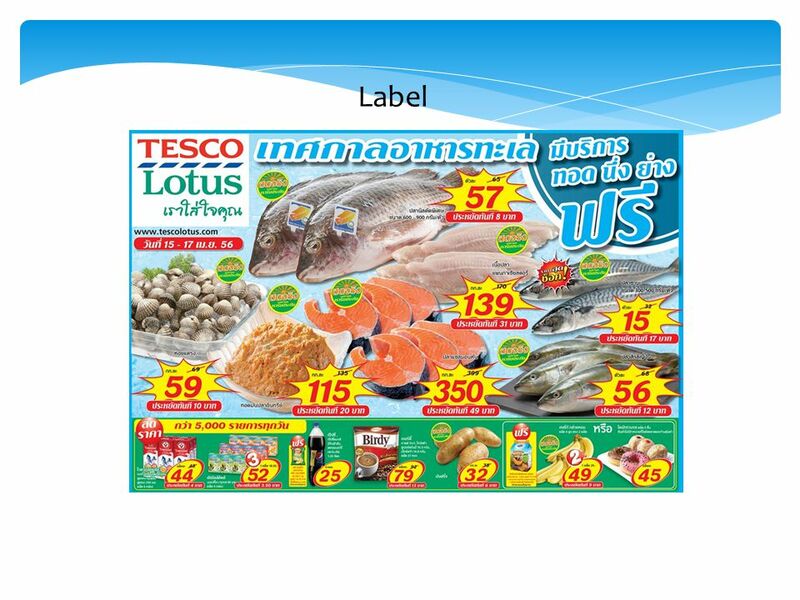 Nawaporn : It’s 115 baht ? Do you like it ? Wanan : Yes , I do. Where did you buy ? Nawaporn : I bought from Big C .What color is it ? Wanan : Yellow. I will go now . Bye ! 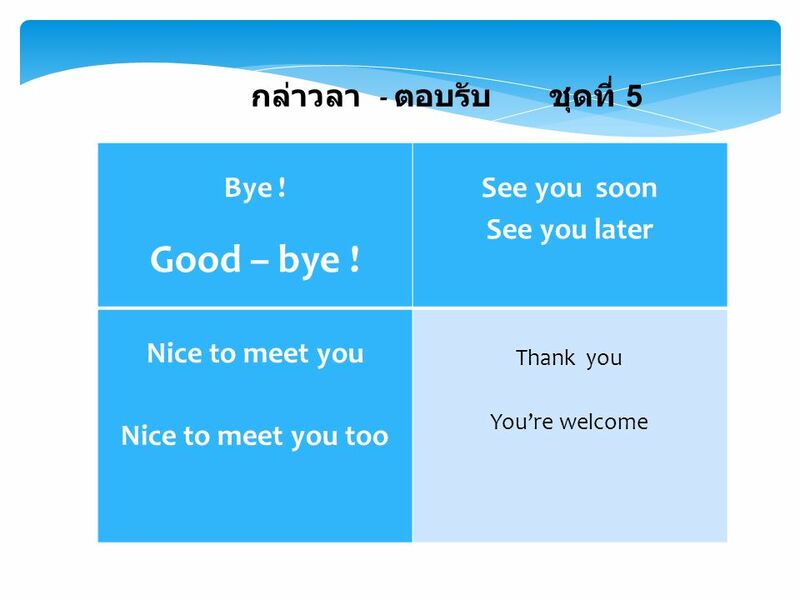 Nawaporn : Good - bye. See you soon . Summary Wanan is my friend . He bought a durian from Big C . It is 115 baht. It is yellow. He likes to eat durian . He’s happy . Note : You can change the underlined words. ที่ ประเภทของการทักทาย คำถามทักทาย การตอบรับ 1 2. 1.แบบเป็นทางการ 1.1 Good morning ( กึด มอร์หนิ่ง ) คำทักทายตอนเช้าถึงเที่ยง 1.2 Good afternoon ( กึด อ่าฟเทอร์นูน) คำทักทายตอนหลังเที่ยงถึงก่อนพลบค่ำหรือเย็น 1.3Good evening ( กึด อีฟเว็นหนิ่ง ) คำทักทายตอนเย็นหรือพลบค่ำ 2.แบบไม่เป็นทางการ 2.1 Hello ! (เฮลโล่) หรือ Hullo ! (ฮัลโล่) หรือ Hi ! (ไฮ) ใช้กล่าวสวัสดีทั่วไปไม่จำกัดเวลา สามารถเอ่ยชื่อบุคคลตามหลังคำกล่าวสวัสดีเหล่านี้ได้ทักทายอย่างเป็นกันเอง 1.ถามแบบเป็นทางการใช้เมื่อพบกันครั้งแรกในชีวิต How do you do ? ( ฮาว ดู ยู ดู ) สบายดีหรือ พูดตอบคำเดิม คือ How do you do ? 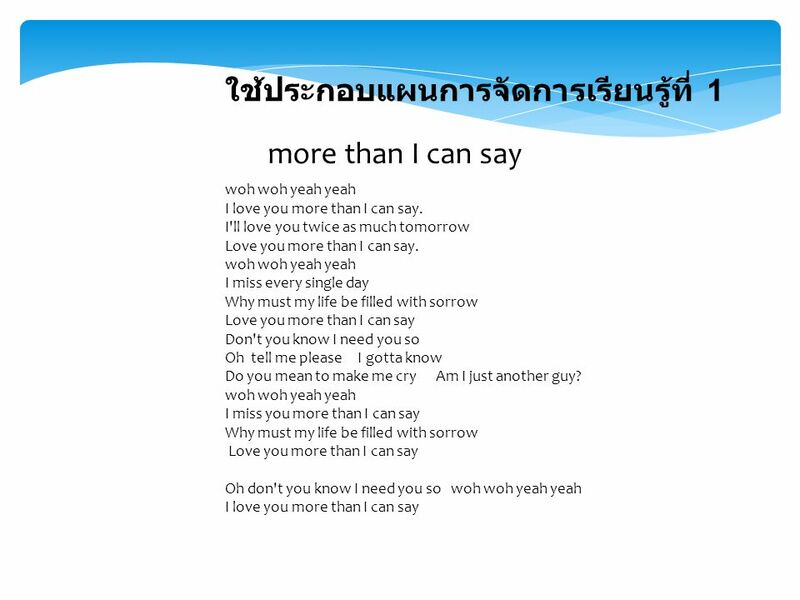 2.พบกันครั้งต่อไปให้ถามว่า How are you ? ( ฮาว อาร์ ยู ) สบายดีหรือ .ใช้ในโอกาสทั่วไป How are you doing ? ( ฮาว อาร์ ยู ดูอิ่ง) Are you well ? . 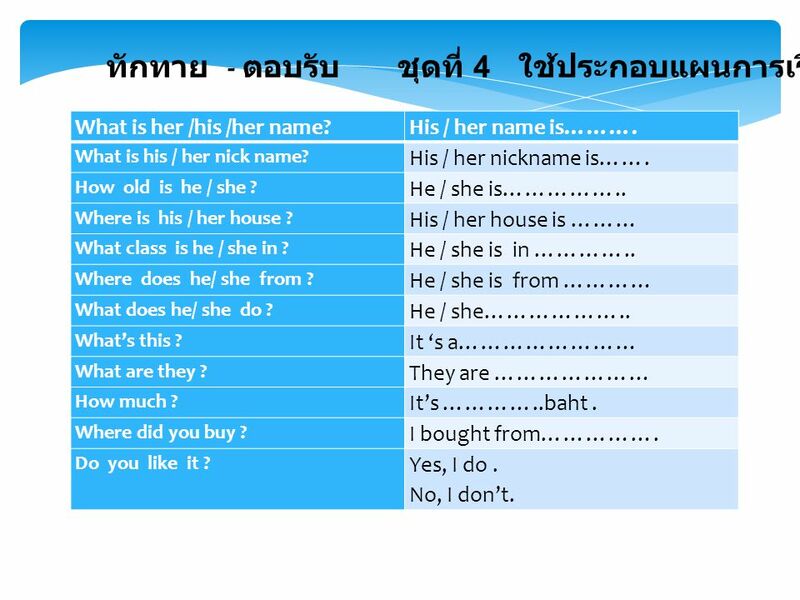 1.ตอบรับแบบเป็นทางการ ใช้เมื่อพบกันครั้งแรกในชีวิต พูดตอบคำเดิม คือ How do you do ? 2.พบกันครั้งต่อไปให้ตอบว่า2.1 I' m fine หรือ well หรือ quite well . Very well. 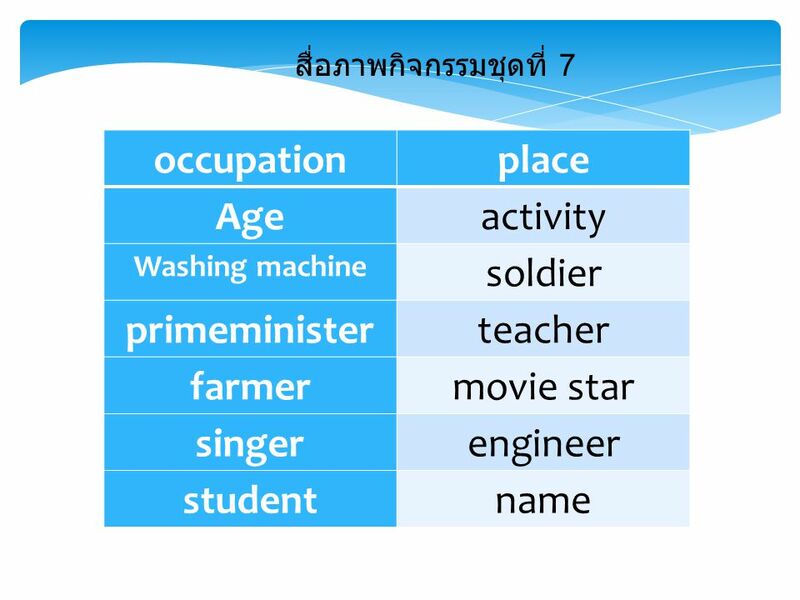 (ไอแอมไฟน์หรืออามไฟน์ หรือ เวล ไคว้ เวล ) สบายดี 2.2 I’m o.k., thanks. Not so bad ก็เรื่อยๆ 3. ตอบรับกรณีเจ็บป่วย 3.1 Not well. (น้อท เวล) ไม่ค่อยสบาย 3.2 I have a head ache. ( ไอ แฮฟว์ อะ เฮ้ด เอ่ค ) รู้สึกปวดศีรษะ 3.3 I have the flu. ไอ แฮฟว์ .เธอะ ฟลู ) ไข้หวัดใหญ่ 3.4 Not so well, thanks. I ( have ) got a cold. หรือ I have a cold. ( น้อท โซ เวล, แธ้งส์ . ไอ แฮบว์ ก้อทอ ะ โคลด์ หรือ ไอ แฮบว์อะ โคล ). Somsri : Good morning . How are you ? Ning : Good morning. I’m o.k. And you ? Somsri : Me too ! Thank you . What ’s your name ? 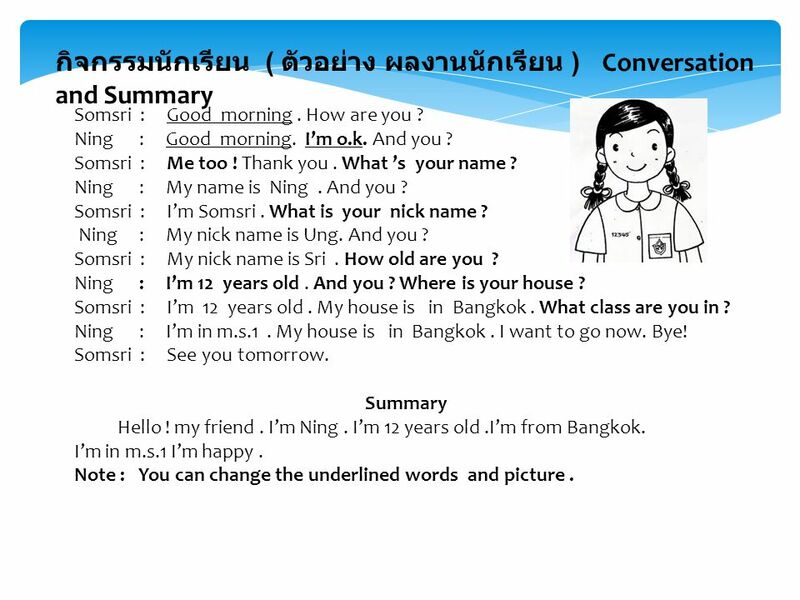 Ning : My name is Ning . And you ? Somsri : I’m Somsri . What is your nick name ? Ning : My nick name is Ung. And you ? Somsri : My nick name is Sri . How old are you ? Ning : I’m 12 years old . And you ? Where is your house ? Somsri : I’m 12 years old . My house is in Bangkok . What class are you in ? Ning : I’m in m.s.1 . My house is in Bangkok . I want to go now. Bye! Somsri : See you tomorrow. Summary Hello ! my friend . I’m Ning . I’m 12 years old .I’m from Bangkok. I’m in m.s.1 I’m happy . Note : You can change the underlined words and picture . 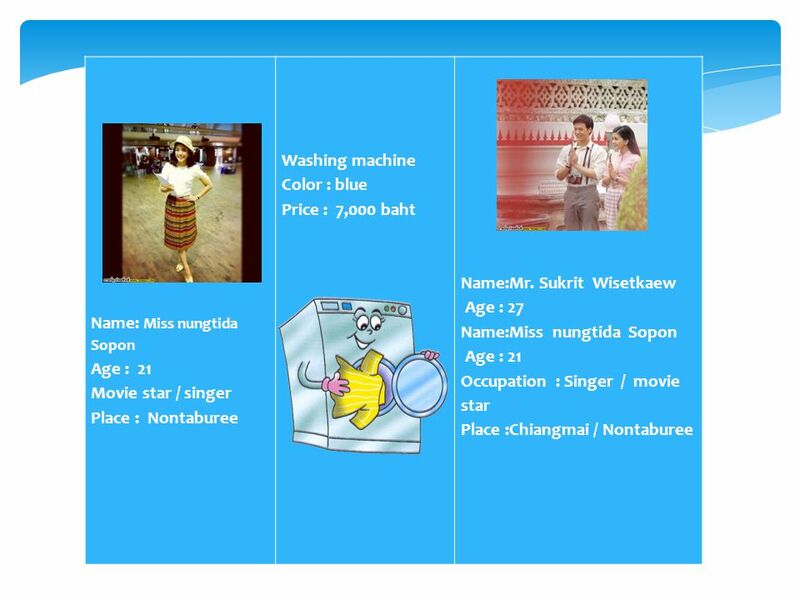 ทักทาย - ตอบรับ ชุดที่ 4 ใช้ประกอบแผนการเรียนรู้ที่ 2-3 What is her /his /her name? His / her name is………. What is his / her nick name? His / her nickname is……. How old is he / she ? He / she is…………….. Where is his / her house ? His / her house is ……… What class is he / she in ? He / she is in ………….. Where does he/ she from ? He / she is from ………… What does he/ she do ? He / she……………….. What’s this ? It ‘s a…………………… What are they ? They are ………………… How much ? It’s …………..baht . Where did you buy ? I bought from……………. Do you like it ? Yes, I do . No, I don’t. Somsri : Good morning , Sanya . How are you ? Sanya : Good morning,, Somsri. I’m happy . And you ? Somsri: Me too ! Thank you . Look at the picture . Who is she ? Sanya : She is Miss Yingluck . Do you know her ? Somsri : Yes , I love her . What is her nick name ? Sanya : Her nick name is Poo. How old is she ? Somsri : She is years old . Where is she ? Sanya : She is in Chiangmai . I want to go now. Bye! Somsri : Bye! Somsri : See you tomorrow. Summary Hello ! my friend . I want to introduce a famous people . She is Miss Yingluck Shinnawatra . She is 45 years old. Her nickname is Poo. She is in Chiangmai . Somsri loves her . She is happy. Note : You can change the underlined words and picture . Somjai : Hello ! Lek . How are you ? Lek : Hi ! Somjai . I’m hot . And you ? Somjai : I’m so so. I want to introduce my friend . Her name is Ratsamee. Lek : I’m Lek . Nice to meet you . Ratsamee : Nice to meet you too . I’m Ratsamee. Are you here ? Lek : Yes, I am . Somjai is my close friend . What class are you in ? Ratsamee : I’m in m.s.1 . And you ? Lek : Me too ! I’m busy now. See you tomorrow .Bye . Ratsamee : See you soon . Where are you going ? Lek : The market . Let’s go. Ratsamee : O.k. I will go with you . Summary Hello ! I’m Lek . Somjai introduce Ratsamee to me . She is her friend . She is a student . She is in m.s.1. She is happy. She and Somjai go to the market . Note : You can change the underlined words . 8/3/2014The Realities of software Testing1 Software testing Realities What is the realities of software testing Why does the software testing not complete. 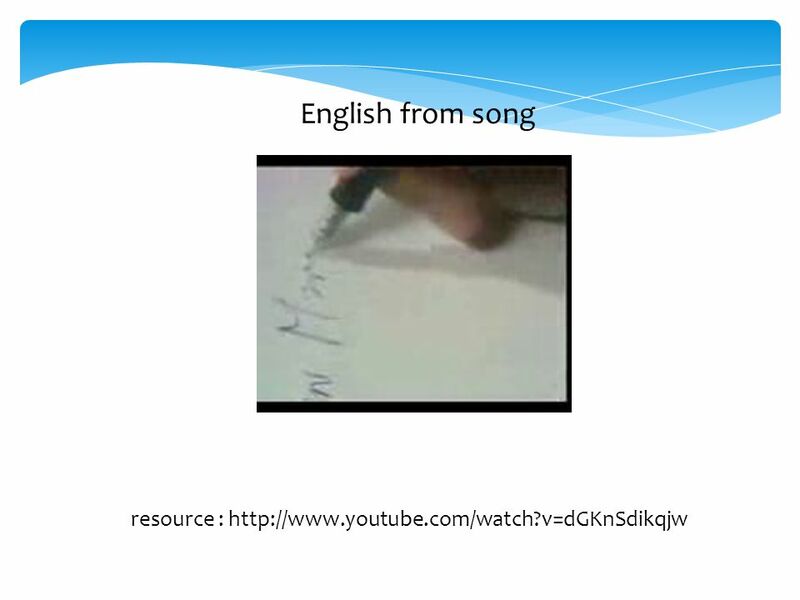 Unit 1 Present Simple Tense.